Haemoglobin in red blood cell. 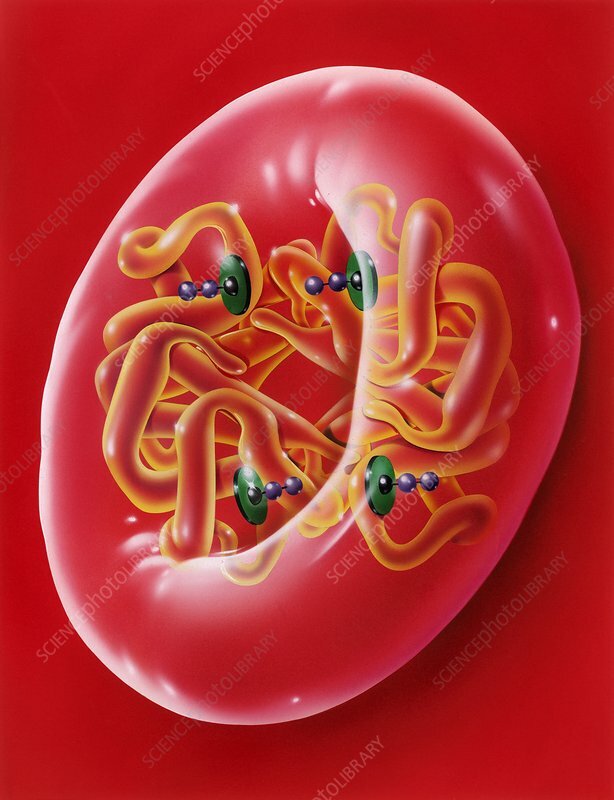 Artwork of a red blood cell (erythrocyte) with a model of the oxygen-carrying haemoglobin molecule. It is this molecule that allows red blood cells to distribute oxygen to body tissues, as well as carry waste carbon dioxide back to the lungs. Haemoglobin has four iron-containing haem groups (coloured areas). The rest of the haemoglobin structure consists of four globin proteins (coiled areas). Each haem area consists of a porphyrin heterocyclic organic ring (green) and an iron ion (ferrous ion, Fe2+, black sphere). It is this iron centre that reversibly bonds to oxygen (O2, purple sphere doublets) and carbon dioxide in the blood.